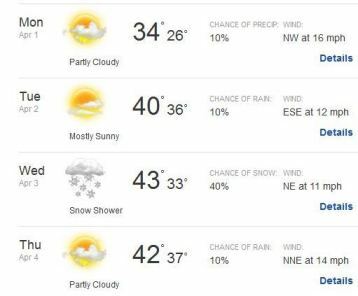 That's a screen grab of the weather.com forecast for opening day and a few days after at Target Field. Cold. Brutal cold. Particularly for the opener, with that Northwest wind at 16 mph. That 40 percent chance of snow on Wednesday is no picnic, either. * Ski mask (this will also help you steal handfuls of meat from the sausage stand). * Booze for hot chocolate (this will also help you withstand the pitching matchup of Justin Verlander vs. TBA). * Butch Huskey gameworn Twins jersey, which can double as a four-person blanket. * Gloves -- not actually baseball gloves to catch foul balls, just regular gloves for warmth. Please add on in the comments, and do know that it WILL get warmer soon. Monday (What Minnesota coaches didn't you want fired?) edition: Wha' Happened?